“Everyone’s favourite original, golden and delicious Kellogg’s Corn Flakes, is now available in a porridge variety, creating yet another opportunity for you and your family to share a wonderful breakfast together- be it summer or winter! It’s the perfect combination- the benefits of porridge coupled with great and original taste of Kellogg’s Corn Flakes. This, together with an affordable price, makes it a delicious and cost-effective breakfast for everyone to enjoy. “Research shows that not only does breakfast offer a vital start to your day, but that porridge is a source of energy. 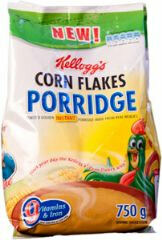 Kellogg’s Corn Flakes Porridge is a source of iron and nine essential vitamins, contributing to a balanced breakfast. “You can enjoy Kellogg’s Corn Flakes Porridge on its own, with hot or cold milk or with water. It’s a versatile breakfast that can be enjoyed by the whole family, and can be prepared quickly and conveniently. Kellogg SA says the product is being exported to sub-Saharan Africa. Interesting, too, is the use of flexible packaging (very eye-catching, it is, too) with no outer carton, clearly a cost-saving measure considering the price point and demographic of the target market.